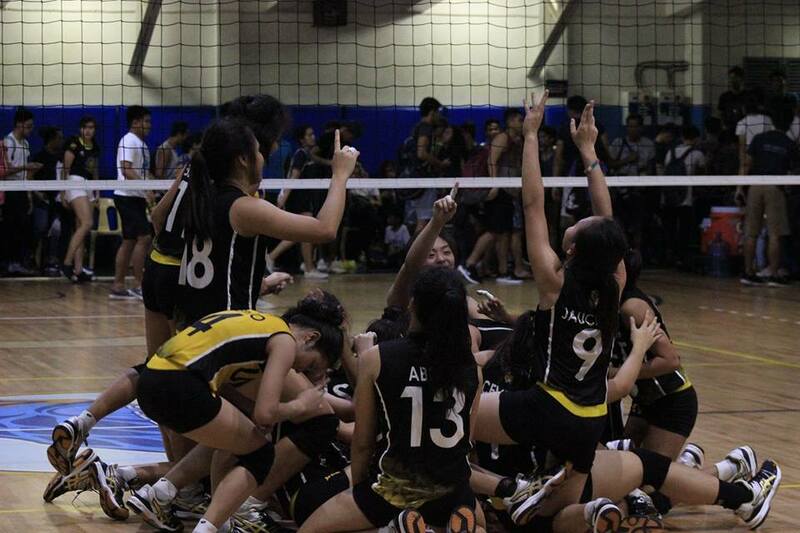 On the 7th of October, 2015, the University of Santo Tomas Junior High School gathered as one family to celebrate the Feast of Our Lady of La Naval. This annual eucharistic celebration is part of the devotion of the university and the school to the Rosary Month held every October and the celebration of the Feast of the Solemnity Our Lady of The Holy Rosary. This year’s theme is Inang Maria: Kalakbay Sa Pagharap Sa Hamon ng Karalitaan at Kabanalan. 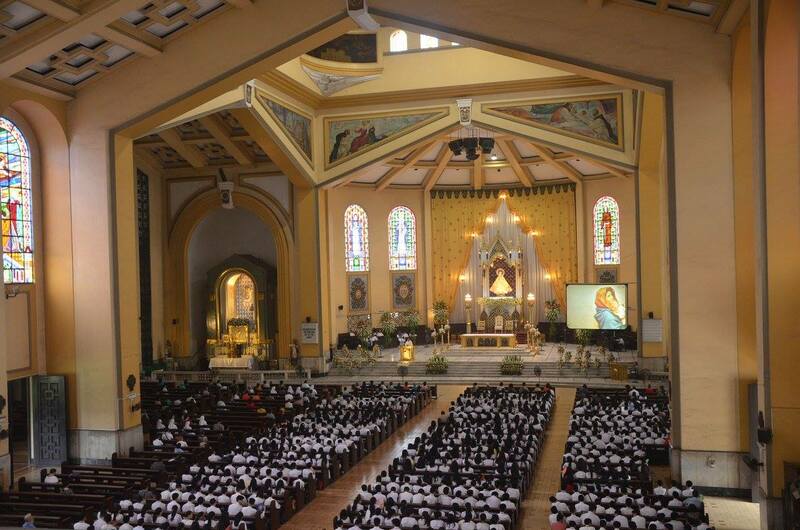 Organized by the Student Catholic Action, the Dominican Network, and the Liturgical Ministry of the UST Junior High School, this year’s mass was held at the Sto. 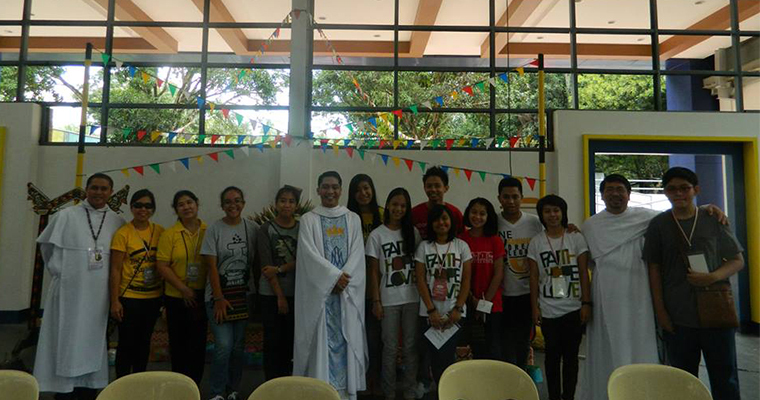 Domingo Parish and was presided by the school regent Father Jannel N. Abogado, O.P. As part of this celebration, the Grade 10 students also participated in the grand procession held last October 11, 2015 at said parish. Eight students represented UST High School in the 19th DYG Summer Camp organized by the Dominican Network Youth Group held at San Pedro College – Ulas Campus, Davao City. The said encounter endorsed the theme “Liberating Truth: Key to Freedom” for five days, from April 28, 2015 to May 3, 2015. UST JHS DomNet Adviser, Ms. Lydia Basaysay, joined the eight representatives: Agatha Tacneng (St. Daniel ’14-’15), Maria Andrea Capiral (St. Dominica ’14-‘15), Micah Apostol and Reinalyn Cadavillo (St. Catherine ’14-’15), Joshua Raphael Tan and Stella Santos (St. Dorothea ’14-’15), Erika Marie De Guzman (St. Dionysius ’14-’15), and Al Vicente Riano Lisboa (St. Cecilia ’14-’15). Teambuilding activities were held in the Bluejaz Beach Resort at Samal, Davao City. On the third day, three DYG alumni namely Kuya Bagani, Ate Ivy, and Ate JV shared their own inspirational stories highlighting their faith in God and overcoming life’s ordeals. All delegates were provided the Youth Annual Report, a narrative which showcases DomNet’s activities throughout A.Y. 2014 – 2015. A new set of DYG officers was also determined on the same day. Another talk with the title “Gawasnong Kamaturoan sa Ginoo” (God’s Liberating Truth) was offered to each contingent by Fr. Stephen Besa, O.P. The fourth day of the DYG summer camp began with a mass presided by Mindanao Vocation Promoter Fr. Norman Quilaquil who shared in his homily that “…a DomNet kid should have a grateful heart, a sincere heart, and a joyful heart.” All delegates registered themselves in various workshops that could enhance their skills involving singing, dancing, drama, photography, painting, or modelling to disseminate further the essence of truth as the ultimate key to freedom. The 19th DYG Summer Camp was concluded by a final mass presided by Fr. Christopher Jeffrey Aytona, O.P. who gave a Pope Francis Cross to each delegate as a “pabaon” along with Fr. Lauro de Dios, O.P. and Fr. John Stephen Besa, O.P. On the same day, the Core Team acknowledged every school’s participation through the awarding of certificates. Jessieca Infante, member of the UST DomNet Core Team, spearheaded the Ritual of Goodbye after the new set of DYG officers had their corresponding inductions.